I had my laryngectomy over 15 years ago. From the outset I was aware of the possible speech options and was very keen to use a valve to speak. I was the first patient to receive a primary puncture at my local hospital. Though for the first few months it was not possible, I was keen to be able to change the valve myself. I was comparatively young and happily had no other health issues, which could impact on managing this myself. At that time the Nurse Specialist or ENT Clinic Sister took responsibility for this matter rather than a Speech and Language Therapist. I have been very lucky and have had few complications along the way so I can still change the valve myself at home, when needed. The duckbill valves are very cheap compared to indwelling valves, which can only be replaced by a clinician. Carrying a couple of spares, I can change my valve without a visit to an ENT clinic or far worse to A&E, wherever I am in the country should the need arise. Are patients being encouraged to use valves they can manage themselves as much as they were ten years ago? Would patients welcome the chance to be more independent of their hospital? Of course some patients have complicated circumstances making self-management impossible. It may be the puncture is in a place that makes it impossible for them to change a valve themselves. There may be other medical or capability reasons why a clinician is needed to do this. The changes in the service since my laryngectomy may well mean more patients can be considered eligible for a valve and the quality of speech has notably improved I think. However, considering the benefits in terms of cost to the NHS and convenience for the patient Eric Blom’s original solution still seems to have a lot to offer. The Joint Council on Vaccination and Immunisation has declined to recommend the extension of the vaccination programme to boys. The medical community is far from happy. Please clink on the link below for more information. This decision will mean that in some years time many men will unnecessarily develop hpv related throat cancer. A busy spring and summer programme came to a close with another trip on Chesterfield canal. This time the destination was The Mill, a hostelry that supplied us with excellent food, most of which had never seen the inside of a freezer! 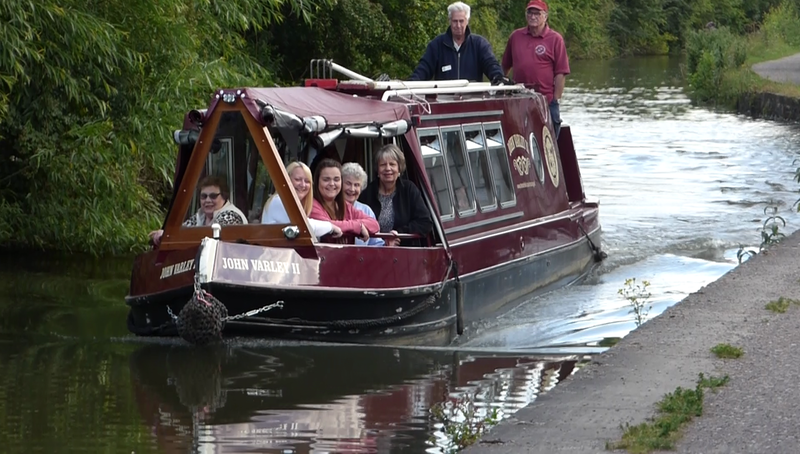 There was plenty to see on the journey with swallows frequently darting down onto the water and mallards squawking with disgust as they had to move out of the way of the barge. We now have our annual break but will be back with our regular meetings in September, when we have also planned a Coffee Morning to mark European Head and Neck Cancer Awareness Week. 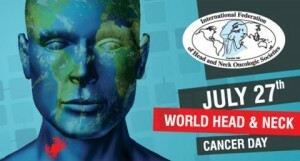 July 27th is designated as the international Head and Neck Cancer Day. There are events organised worldwide, including in the UK, to mark the day and raise awareness. 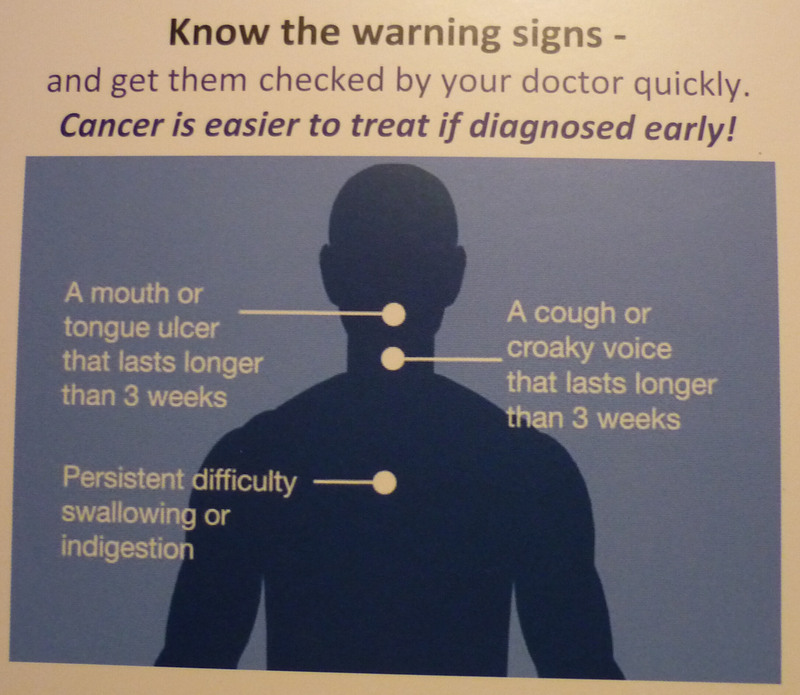 As with all cancers, early diagnosis is a key factor in survival. In the picture below some common signs of head and neck cancer are shown. Additionally, why not check your mouth for any suspicious signs or better still ask your dentist for a check up.